Empowered to Make a Difference! 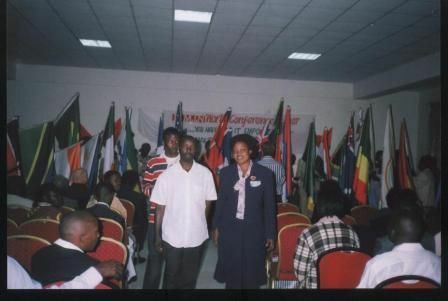 The first-ever World Conference outside of the USA was glorious in every way, from the magnificent flag procession of thirty-three nations with FMIN Partners, to the lively African praise and worship, to the love of God being spread to every person in attendance. 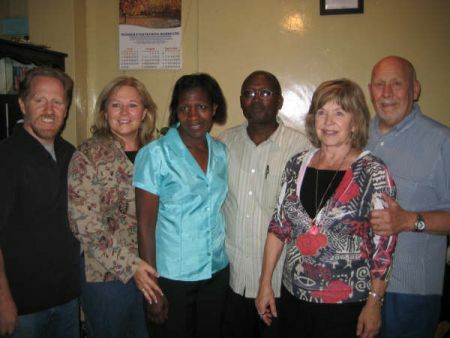 A new experience was added as team members from the USA and England gave of their time and energy to spend daytime hours ministering to hundreds through medical clinics, AIDS awareness and healing prayer teams in a poverty-stricken area of the city of Nakuru, Kenya, East Africa. Over 650 adults were born again and hundreds of children. Children wanted prayer more than candy. Delegates from Tanzania, Uganda, Kenya and India enjoyed the camaraderie of like-minded brethren. As the simplicity of the gospel of peace was preached, one could almost see light bulbs turning on in peoples' minds and hearts. Their smiles were widening. People were being set free as they learned what God thinks about them, that their relationship with Him through Jesus Christ is rock solid; that they are loaded with everything they need for life and godliness. The modeling of couples sharing and teaching together and working together as a team changed marriages! People conveyed to us that they are completely devoted to gaining instruction in the grace gospel to share with others. They are willing to move from place to place to spread the message through starting bible schools and planting churches. Many agreed with the person who exclaimed, "We've never been to a conference like this. It is the best one ever--the way the team freely related to everyone, the depth of the Word preached in such a relaxed way. Miracles happened without any screaming." A pastor expressed his shock at seeing husbands and wives teaching together. "This is a powerful concept I had never thought of. I will start to do this with my wife!" Many others expressed how good it was to be at a conference where everyone was equal and there were no "big shots." passed your greetings, love and stories to the church on Sunday. I saw a new gift manifest. The manifestation of the joy of the Lord. People were laughing when I touched them with the microphone!!! That was new to me. I must have picked it up from the chops!" 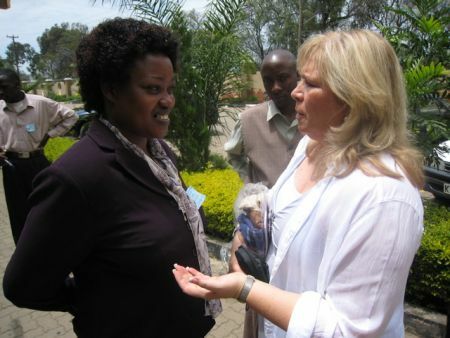 Kendyll Merrell sang a prophetic word over Kenya: "In two years' time, this whole nation will be healed, transformed. Generations will be born. Prosperity will come. Christ's life within you will spread out His joy, His life, His peace--in two years' time." We see so many future possibilities of digging wells to provide clean water in these communities that have none! We hope to support the education and new businesses there too. us ministers of the Word. It has given us divine purpose and taught us who we are. It has made us bold. I have peace and joy! I'm blessed!" 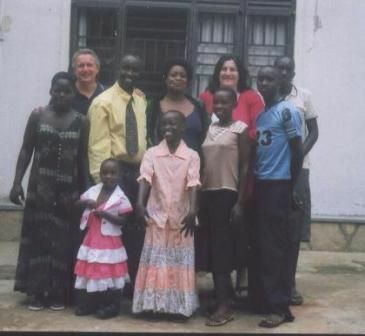 Before arriving at the World Conference, Andy and Debbie Greene from England ministered in Uganda for ten days. 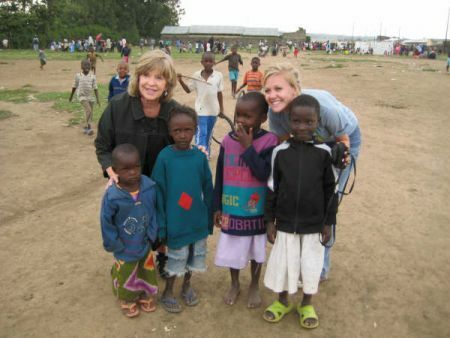 Andy related, "I can honestly say that I now understand why people fall in love with Africa. The people are so warm and generous, and the joy of life and passion they live with are infectious." Andy continued, "We really found how the Network can and does operate. It is simply friends across the world uniting to help and encourage each other." Through our Network, a family of faith, we can be a part of a continental transformation through the exponential increase of the spreading of the gospel of peace. To better service our international vision and our international partners who often can't get visas or funds to travel to the US for our annual World Conference, we decided to locate our conference every other year on international soil. 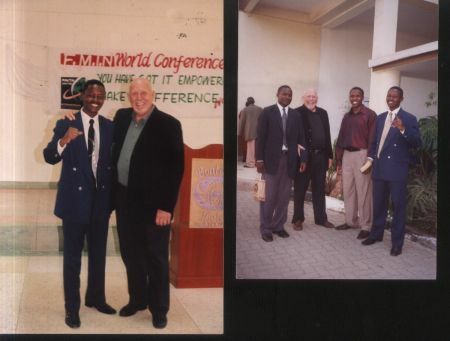 This year, October 10-15, Faith Ministries International Network went to Nakuru, Kenya, East Africa for FMIN World Conference '07, Kenya. 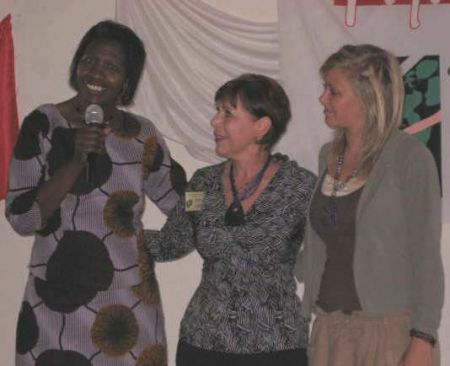 It was an overwhelming success with an awe-inspiring response of hundreds of friends and Partners making the sacrifices needed to come together in Nakuru from Kenya, Tanzania, Uganda, India, and England for this event. 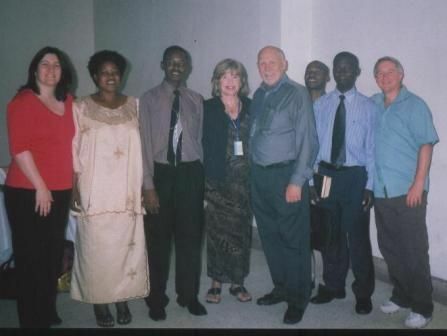 We also had nineteen US Team Members who gave their all to make this long trip to Kenya, as they were determined with all their hearts to arrive on African soil and minister and fellowship with the brothers and sisters in the Lord there. The message of grace and peace was preached, workshops reiterated the right message, miracles happened and teams were dispersed throughout the week to surrounding areas with God's love and medical supplies. When plans for this event were being made, we declared: "This will be a life-changing event!" "We can impact the nations!" "The time is now!" 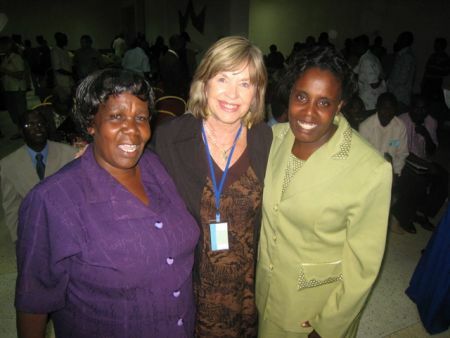 Blessings and the Joy of the Lord are what comes to mind about the 2007 World Conference in Nakuru, Kenya! Seeing the way God lifted up so many pastors was fullfilling and special. The opportunity to minister to so many and see so much healing was the best. I was delighted to see how open everyone was to emotional healing and to natural health. The Health Reports (QFA'S) were eye-opening concering the state of health for African's. I performed 162 QFA's and from the results I am ready to go back with home-remidies and other solutions for healing. Our Team was exceptional and ministering with and to each other was a highlight of the trip! Asanti, the Swahili word for thank you has been a part of my prayer language since I got it at the 2003 World Conference. I was so blessed and excited, I truly feel called to Africa! I have been made to surely believe that FMIN really works tirelessly “to its partners to facilitate the advancement of the Kingdom of God beyond the ability of any single partner.” This to me has been made clear at Nakuru where I personally felt that I was in very big family meeting. Everybody looked very happy, even happier than members of a family gathered together. I came to the conclusion that only Jesus could provide such a state of family hood. Praise the Lord. We had a very nice journey back to Tanzania and we hope that you also experienced such a safe journey. My family and members of Evangelical Mennonite Church were very happy to see us back home; and hope that there is a day you will be coming to Tanzania. They all welcome you. We pray that God will make the day for that visit. Pass our heart felt greetings to all who came with you to Kenya. We loved and appreciated their teamwork. May God bless them all. The testimonies filled our eyes with tears. They all had wished they had brought their wives but had never been to a conference where women were welcome or invited. These men went home changed and now the message they give will change those around them. William is from Uganda. His wife didn't want him to come because the cost was so high. It probably cost them $30-40 just to ride the bus for 10-12 hours. When we gave him a gift bag from the network, he started to cry. He was receiving CDs each month from FMIN but had no way to listen to them. Each pastor was given a small portable CD/DVD player. Then he found the jewelry given for his wife. He was so excited! At the end of the conference his testimony was that he was going to go home and tell his wife he loved her. The example we were to these people changed them in such awesome ways. 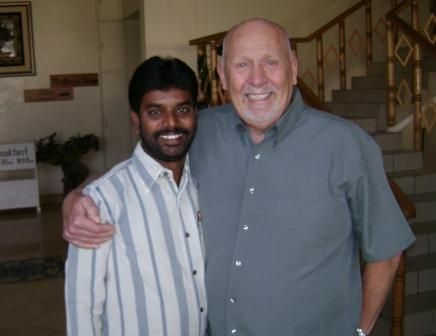 They were not used to mission teams coming in and being so approachable and loving. They had never seen that or a husband and wife team ministering together. They left feeling so free! What a wonderful time it was being with you all in the conference. I always get refreshed whenever I spend time with you Papa Dave, Mama Bonnie, Dennis and Denise. It is also so wonderful to meet and know other people and in unity understand the message of love, Grace and peace. Thanks to Bill and Lenah, you are wonderful. Your work blessed everybody. May the Lord reward you for your good work Phil 2:10. Thanks to FMIN for holding the conference in Kenya. Now I know more people and soon I will be visiting them and in communication with them and build relationship. I believe that everybody who attended got the message - We've got it, we are loaded, we are the righteousness of God in Christ Jesus. We have peace with God. We were all blessed and we are looking forward for the big crusade after 2 years, just as it was prophecied in the conference. I will be preparing for it. Be blessed. Gal 3:14. May the Love of GOD stay in you and the teams you came with. I come from Kisii, the western part of Kenya. I have attended several conferences but not as inspired as the one at Nakuru where I met the Apostolic team called to serve the Almighty. I saw the meaning to love one another. Thank you the Duells and Capras and the Kilels for the teachings and hospitality you showed us. I came from there, never will I be the way I went there. I PRAY God to give you more days on Earth to teach and unite the saints and talk in one voice and joy together. by: Pastor Moses Nyabioto Liberty Church. 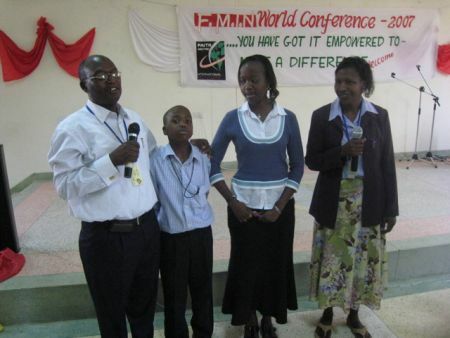 Thank you, Bill and Lenah, for your wonderful coordination and facilitation of the FMIN World Conference in Kenya! Everything flowed smoothly and lives were forever impacted by the Good News of God's love, peace and grace. 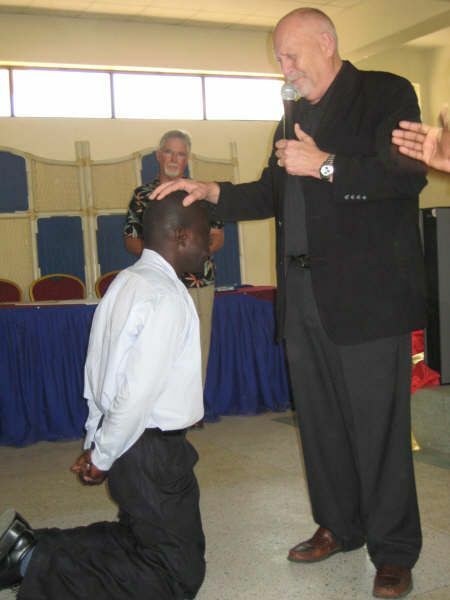 You have been raised up at this time in history to reach the entire African continent! We are thankful to be connected with you. We accomplished our goal of World Conference--getting the Good News message to our leaders and others. They saw unity, the same thing being spoken by all speakers, accessibility to speakers where people could talk to them without bodyguards stopping them. We all experienced the love exhibited by everyone. 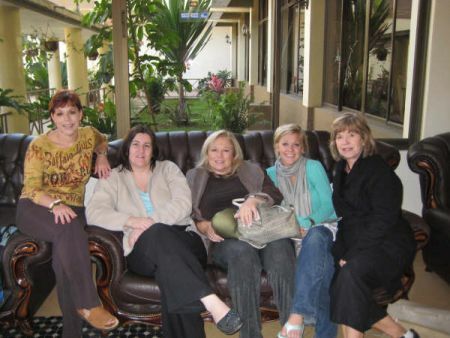 We are praising God for all He did for His people at the Conference in Kenya! Thank you for the lovely messages you gave us in Kenya-Nakuru. I just want you to remember me always in your prayers that I may always walk with Christ forever. I write this letter to thank you for everything that you have done. Thanks again for everything. 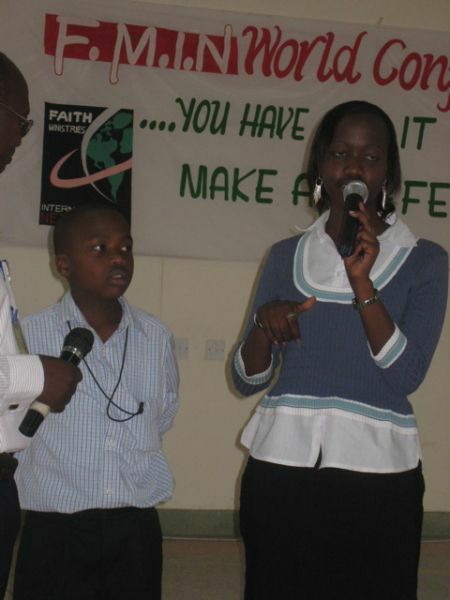 Lang Kilel is Bill and Lenah's 10 year old son in Nakuru, Kenya. 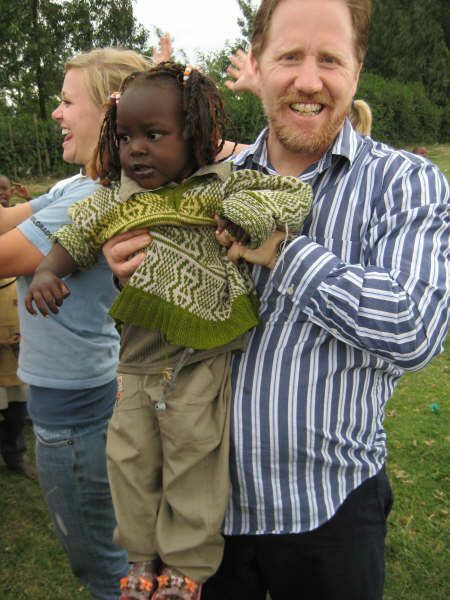 I knew that Kenya would change me forever! I have never felt nor been more loved. 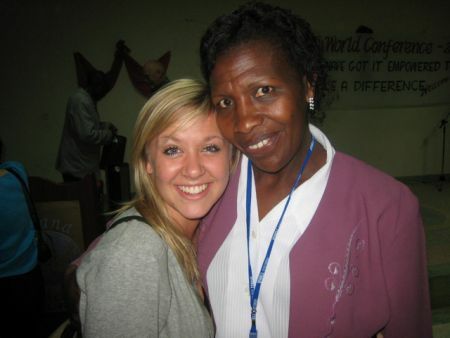 The African Christians and of course Silvi were a source of inspiration for me. Thank you for allowing me to participate in Team America. 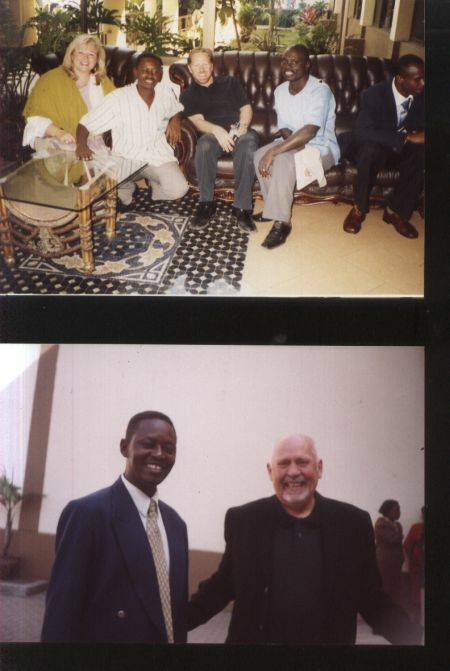 Greetings of love to you from the Pearl of Africa -- Uganda! I love you and I will never forget your love, jokes and the wonderful messages you preached! May God bless you and reward you. 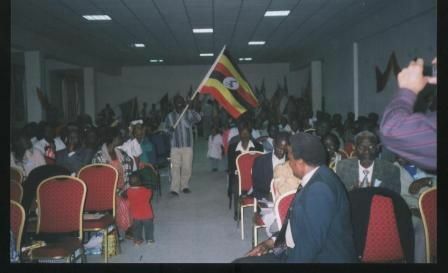 I have attended a number of conferences in Kenya and Uganda but I have never been in a conference which was as good as this one!! The presence of God took over every thing and everyone was full of love and joy. There was unity and cooperation in every thing! We enjoyed Dave like a hot cake! I've never seen some one as free as Dad Dave! 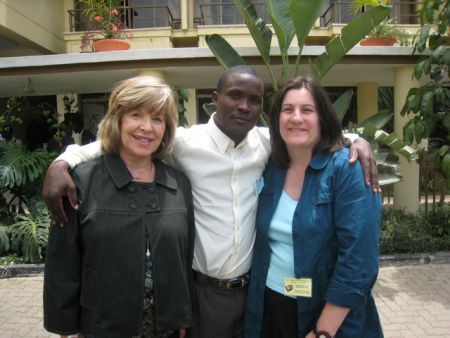 And I can't forget Dennis and Denise Capra! Very good for every one and loving. I knelt in the midst of them joking and I wasn't chased away! 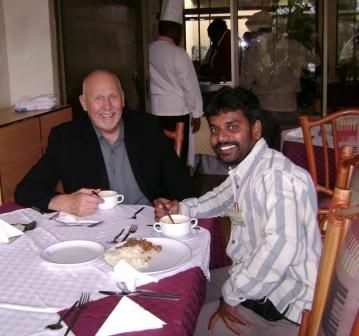 Then Bill Kilel and his wife always followed us to the hotel to make sure we were well fed! At the buses, they were making sure we got the right buses! Very good people, may God reward them. May the Almighty Father bless you and reward you in all. 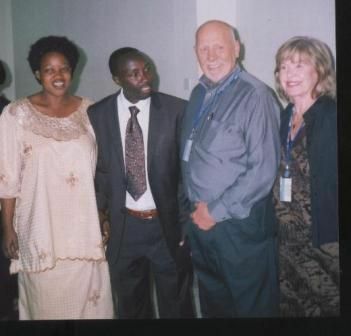 Charles and Florence Busiingye live in Kazo, Kampala, Uganda, where they pastor The Rivers of Joy Church and Ministries. 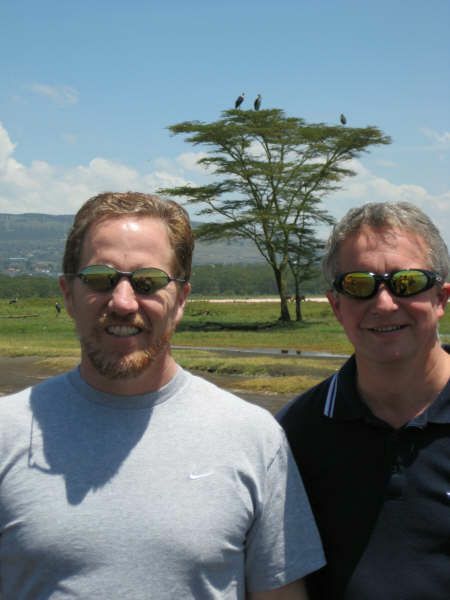 Well we are back from Africa and delighted with the way the trip went. We really found how the network can and does operate. It is simply friends across the world uniting to help and encourage each other. I can honestly say that I now understand why people fall in love with Africa - the people are so warm and generous and the joy of life and passion they live with are infectious. 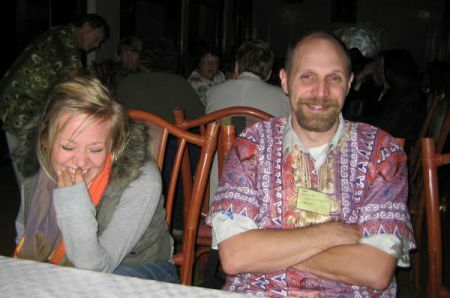 We spent the first 10 days in Uganda 2 of them travelling and the rest teaching except for one admin day. In the 7 days left we did 3 conferences and spoke 17 times for an average of about 50 minutes each time. On most occassions we spoke together and this proved a little surprising for most of the people. Many had never seen a white person and even more had never seen a husband and wife minister together. It was a real joy working together and was very effective in reaching the people and communicating the Grace message. We were in many places, schools, villages, towns and cities and the people were wonderful. They were so keen to hear the gospel message and thirsty for God. The worship was amazing and we saw God act in power. 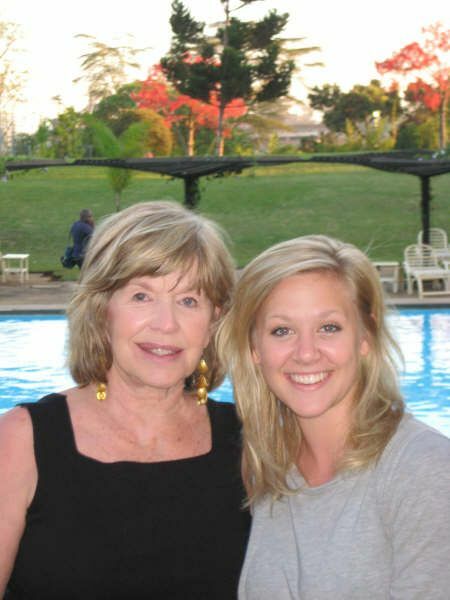 For the second part of the trip we went by bus to Nakuru in Kenya and stayed in a hotel which was very different to the simple joy of living with Ugandan families in the first 10 days. The conference was great fun and again the worship was incredible. We also went out into the villages and slums with the team to hand out medicine and pray for people. The team were wonderful and of course Dave and Bonnie and Dennis and Denise were there unsual amazing selves. During our time we saw many people healed, 5 recovered sight many had pain leave immediatly, temperatures of children with fevers vanished, bad backs healed, hearts that were not working properly healed and a child with an extended stomach have the stomach reduce to near normal size. We saw people saved and baptised in the Holy Spirit and lives transformed through the power of God's love - which was the basis of every talk we did. We serve an amazing God and every time we stood up to speak we felt the Holy Spirit guide us in what He wanted to say. Thank you for the blessings you brought to the people of Africa!! It was such a wonderful meeting that we are still getting reports from all who were here. They praise God for that and wish that it could be here again next year. You are all blessed and thank you again.